Some of the major players comprised in automobile muffler market are Apexhaust, Onyxautosilencer, ASPO Ltd., Faurecia, and THUNDER among others. These players are set to bolster the automobile muffler market in the near future. According to the experts at Zion Market Research, the Global Automobile Muffler market added up for USD 3.89 Billion in 2014. The automobile muffler market is expected to cross the USD 6.41 Billion by end of 2022, developing at a CAGR of almost 6.6% from 2017 to 2022. The global automobile muffler market is likely to develop exponentially in the years to come. The automobile muffler market is boosted by stringent exhaust noise laws and increasing environmental concerns. Rising user base is likely to open the future development avenues for the global automobile muffler market players. In addition to this, developing market of the electrical scooter and electrical motorcycle is likely to power the development over the forecast period of the automobile muffler market. In addition to this, increasing R&D by government and different market players is sets to bolster the development of the automobile muffler market. For example, in September 2018, Param Jaggi (the graduate from Plano East) came up with a system for car mufflers that employs algae to get rid of CO2 from the exhaust, thereby enhancing the growth of automobile muffler market. Automobile muffler market can be divided by vehicle types such as scooters & moped, motorbike, and snowbike among others. On the basis of sale type, the automobile muffler market is divided as aftermarket and OEM. Rising R&D spending in different developing nations comprising China and India, paired with major leading 2-wheeler makers extending their production capacities all over Asia Pacific is likely to reinforce the automobile muffler market in the area. The e-scooters market and e-motorcycles market is boosted by high requirement for these vehicles in China, where the bulk of these cars are trade. 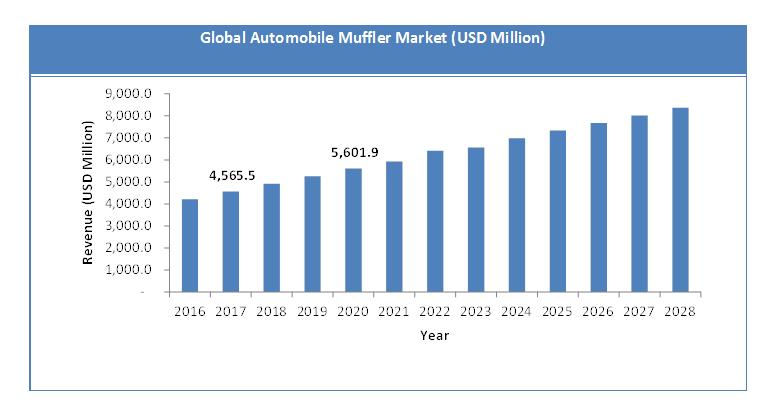 Increasing vehicle population’s age is supporting the aftermarket for mufflers, boosting the automobile muffler market. On the basis of geography, India, China, and America are likely to see major development in the forecast period. High requirement for automobiles in China and India is boosting the automobile muffler market in Asia Pacific. Requirement for motorcycle in the U.S. is rising at a quick speed and is likely to reinforce the automobile muffler market in the U.S. This, in return, leads to healthy CAGR over the forecasting period of the worldwide automobile muffler market.